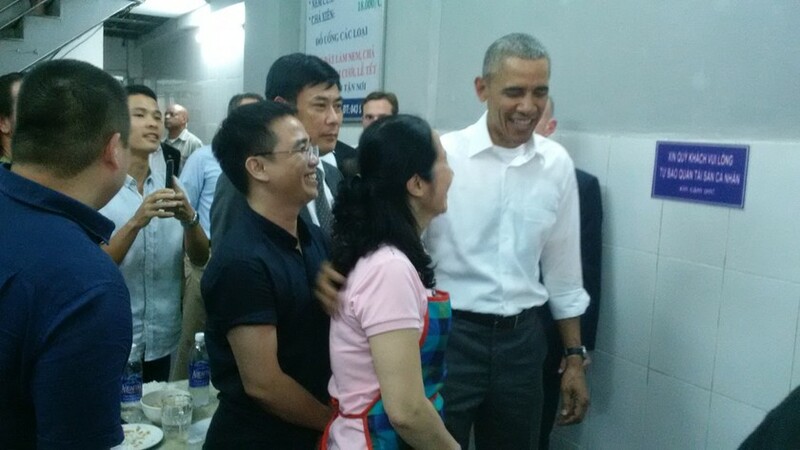 U.S. President Barack Obama and members of his delegate had one of Vietnamese must-try speciality for dinner on his first night in the Vietnamese capital yesterday at 8:00pm. The U.S. leader arrived at Huong Lien restaurant at 24 Le Van Huu Street in Hanoi - one of the most well-established place - to enjoy bun cha - vermicelli with minced pork balls and fresh herbs. He smiled with everybody in the restaurant and was greeted by other dinners. Stopping in the eatery door, Obama showed his kindness to everybody and friendly shook hands with the owner. Mr. Obama and the delegate walked upstairs to a special section reserved for them to have his dinner. Some residents in the street were invited to have the dinner with him. 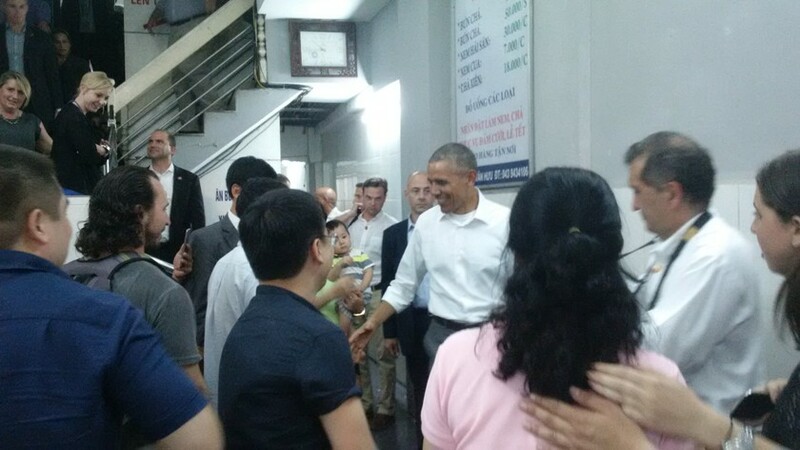 Talking with Sai Gon Giai Phong reporter, Nguyen Mong Hung, owner of a coffee shop at 26 Le Van Huu Street, one of whom were invited to have dinner with Mr. Obama, said that Mr. Obama showed his friendly gesture and happiness saying that the bun cha is very delicious. After one hour, Mr. Obama left the eatery. Before leaving, the US leader and the restaurant owner had a photo taken. He thanked the owner to serve the speciality adding that her bun cha is number one.